This blog is a little throwback to our biggest ever corporate terrarium kits workshop with snapchat. The guys at snapchat have this super amazing meeting called council, where they discuss all kinds of things. Every now and then there is a creative council and we were asked to come along and host a terrarium workshop in each session. What kind of terrariums did they make? Overall the team made over 90 medium sized succulent terrariums, and they look amazing! A mix of Crassula and echeveria were used, alongside a bunch of other random terrarium succulents. Each attendee took their terrarium home as usual, or some kept them on their desks to brighten up their office space. 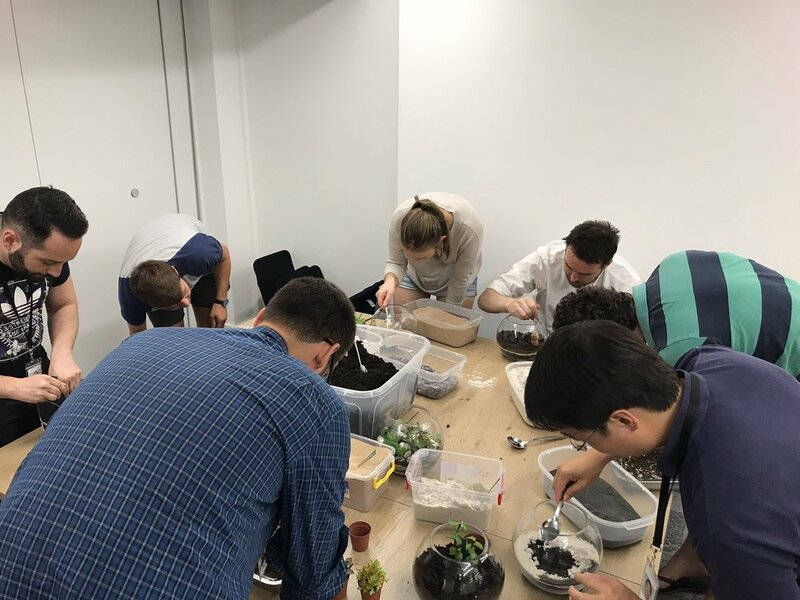 Corporate, or team building terrarium workshops are a great way to get a team creative, and also just to have a great time. We can come to your office or party to host the terrarium workshop, or we can help you secure a venue. The best way for us to build you a package is to get in touch and tell us a little more about your event or what you’d like at the workshop.